Learn about our 6 point lightning and surge system. Florida Lightning Protection offers a complete lightning and power surge protection system supported by over 50 years of successful field performance. We design our lightning-surge systems to capture, convey and ground dangerous electrical voltage. The combination of a structural protection device, surge protection equipment and earthing / grounding provides a safety shield for your home. The Lightning Preventor 2005 protects from damages that may occur to the structure due to direct lightning strikes, and we incorporate surge protectors to address the danger to electronics from transients and surges. 1. Capture the lightning strike to a preferred and known point via the installation of one or more lightning air terminations [lightning rod] on the building. 2. Convey the strike to ground in a safe manner through a known route. This involves the installation of one or more down conductor systems. 3. Ground the lightning discharge. 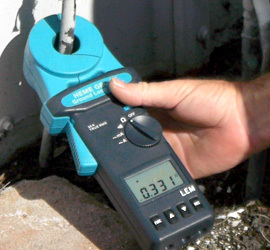 This requires the installation and maintenance of an effective grounding system. 4, Protect all power lines entering the structure from transients and surges. This requires the installation of surge reduction filters, line conditioning equipment, uninterruptible power supplies, or other measures depending upon the circumstances of the site. 5. Protect all incoming data lines and signaling lines from transients and surges. This involves installation of high speed protection components and the correct earthing of cable shields. 6. Eliminate Ground Loops. This requires careful planning, the creation of a single grounding system and consideration of equipment installation practice. A low impedance earth network is essential. It is important to implement all six points of a protection system. Failure to consider one of these will inevitably make equipment vulnerable to damage. Contact us today for a free evaluation of your lightning protection plan.